With a career devoted to cultural exchange and experiential learning, Lauren served nine years as assistant director at a “conventional” agriculture exchange program before founding MESA. Inspired after speaking with an organic farmer, and alarmed by the increasing incidence of pesticide-related medical claims made by trainees in her old program, in 1994 Lauren founded MESA to promote sustainable farming alternatives throughout the world. Lauren’s Lithuanian grandmother’s wonderfully inventive cooking, coupled with a B.A. in Russian Language & Literature from the University of New Hampshire at Durham, sparked her initial interest to pursue a career in cross-cultural exchange focused on food and agriculture. In 1996 Lauren successfully negotiated the Kafka-esque designation process for MESA to become a J-1 Training and Cultural Exchange Program with the U.S. Department of State. Lauren served as Executive Director until 2013. Lauren now delightedly shares director duties under MESA’s newly minted shared directorship model. Since late 2013, Natalia has been a devoted to MESA’s network both online and on the ground. Now as Collaborative Director, she spearheads the development and management of MESA’s Social Learning Network for Social Change as well as the Certificate in Applied Agroecology and the Climate Course for Farmers. Natalia supports MESA through grant writing and research design. In 2015, Natalia supported the fundraising and development for MESA’s beginning farmer training program, to support fellow immigrants in realizing viable farm business. Natalia immigrated to the US from Colombia at a young age. She comes from a lineage of software developers and agriculure enthusiasts. She’s blessed to be able to combine these two interests at MESA; where her respect for agroecology need not be held back. As secretary of the Latinamerican Scientific Society of Agroecology she frequently looks for ways to integrate agroecology research & education into MESA’s work. Natalia is currently working on her PhD at UC Davis in the Geography Graduate Group. Off hours Natalia can be found late-nite scheming with colleagues and friends or milking her goats at midnight. Katie has worked for over a decade in the food movement as a researcher, writer, educator and beginning farmer. She ran an international, solidarity travel program for four years bringing people to the frontlines of the global Food Sovereignty movement, working with affiliated partners from La Via Campesina, The Basque Farmer’s Union and The Korean Women’s Peasant Association. After advocating for farmers internationally for many years, she decided it was time to get her hands dirty in local soil and completed the 6 month apprenticeship program at the University of California, Santa Cruz Center for Agroecology and Sustainable Food Systems, where she graduated with a Certificate in Ecological Horticulture. She also holds a B.A. in International Studies from the University of California, Santa Barbara which grounds her work in global systems and social justice. When she is not at MESA, Katie farms at Singing Frogs Farm in Sebastopol, CA, growing food and sequestering carbon! Shelley Hawkins is a beginning farmer and budding educator hailing from the East Bay. Recently graduating from the Bay Area Farmer Training Program, she has dedicated time doing outreach and engagement to other graduates of the program and for future BAFTP cohorts. Shelley wishes to create projects geared toward making vital farming information-as it relates to food Justice through a racial justice lens- to community members most impacted by systemic exclusion from these spaces. Leah joined MESA in 2004 and now serves as Collaborative Director. Her Humboldt farmland roots instilled a love for food and farming practices that nourish people and the planet. Leah moved to the Bay Area in 1999 to pursue degrees in Environmental Policy and Spanish at UC Berkeley. She has lived in South and Central America as well as Southeast Asia working on behalf of social, environmental and food justice initiatives. As a result of her travel and work experiences she gained insight into myriad traditional agricultural practices, implications of a globalized corporate food regime and the value of farmer-to-farmer knowledge exchange, agroecology and unconventional multi-interestholder collaboration. Her past work experience includes program development for the International Institute for Bengal Basin which focused on pollution mitigation for farmers and rural communities in Bangladesh, fund development for the East Bay Sanctuary Covenant and supply chain review for Scientific Certifications Systems. Leah is a co-founder of Wild and Radish, LLC, and developing a 10-acre urban farm and eco-village in El Sobrante, CA. She currently serves on the Board of Directors of Planting Justice, an Oakland non-profit creating green jobs and democratizing access to affordable, nutritious food. Climbing rocks, yoga, milking goats and befriending bees are frequent sources of fascination. Paul joined MESA in 2016 as the Co-lead Farm Educator for the Bay Area Farmer Training Program. 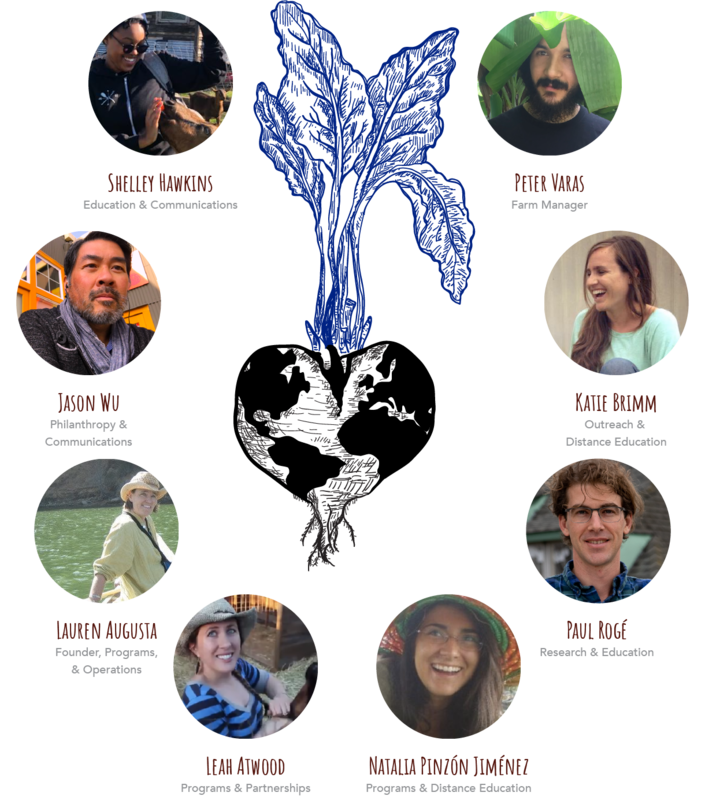 In addition, Paul conducts research on urban agroecology at UC Berkeley, manages farm operations for Don Bugito in West Oakland, and co-founded the Cooperative New School for Urban Studies and Environmental Justice. Paul has been involved with organic farming & marketing, agroecology, and social movements for the past 15 years in CA and abroad (Brazil, Mexico, Mali, and Malawi in particular). Paul’s experience in organic farming & marketing comes from his background in Bay Area worker collectives, as well as growing vegetables at ALBA and several other organic farms. Previously, as a Research Associate at Michigan State University, Paul studied the potential for perennial staple seed and pulse crops in smallholder farming systems of Mali and Malawi. His doctorate at UC Berkeley involved participatory research on climatic variability and rainfed agriculture with CEDICAM, a civil society organization in the Mixteca Alta of Oaxaca, Mexico that uses the farmer-to-farmer training methodology. Peter came to MESA shortly after completing the Bay Area Farmer Training Program in 2017. Peter has a deep commitment to agroecology, food sovereignty, horizontal knowledge exchanges and community organizing. He’s excited to be able to continue this work at MESA. Prior to working with MESA he got his start in the agricultural world working in education and conservation of butterflies and native plants at Butterfly Farms in Encinitas. This lead to being the first in his family to go to college, he attended UC Davis where he received his B.S. in Sustainable Agriculture & Food Systems with a focus on Agroecology. Here is where the love for agroecology and food sovereignty was cultivated. While at UC Davis Peter worked with a number of farms and organizations including Wilton Rancheria, Acta Non Verba, Green Gulch Farm, and the Tatanka Wakpala Model Sustainable Community. When Peter is not at MESA you can find him skateboarding around the Bay Area guerrilla gardening with his friends at Black Earth Farms or organizing with youth to spread food sovereignty across the country. Lauren developed an interest in food and agriculture during her time as a geography and political science major at Bucknell University. She later went on to get a graduate degree in geography from Penn State, where the focus of her research was agricultural supply chains and stakeholder decision-making for farm-to-school programs. She now feeds her passion for agriculture through participating in an Oakland community garden and serving on MESA’s board of directors. Lauren currently works as a Program Manager for Environmental Defense Fund’s Oil & Gas Program. Mary Collins aka “Mary from Maryland” has worked with animals ranging from cattle to cheetahs. Working in wildlife conservation made her question its connection to sustainable agriculture, so she joined the Peace Corps to learn first-hand how people farm and eat. In Panama, she worked side-by-side with famers and families to implement sustainable agriculture techniques. She extended a third year to serve as Regional Coordinator, a role in which she served as a bridge between Peace Corps, local government agencies and communities. Currently she is getting a Master of Public Policy at University of California, Berkeley and plans to work with sustainable agriculture and environmental conservation. Bill’s entire working life has had some connection to the family farm. Childhood chores on the farm progressed to adult responsibilities and eventually Bill managed the dairy and walnut operation for the family. Meanwhile he ran a photography studio in Gustine for 30 years and spent short stints with the US Postal Service and the local newspaper. As the family phased out of “conventional” farming Bill began growing and selling vegetables from about 2 acres carved out of the original family farm. Using regenerative practices, Bill has cut outside inputs to a bare minimum while reducing pest and disease problems. Contented Acres Produce operates a semi-weekly farmstand, and runs a small CSA. Bill has hosted five different MESA stewards from four countries with financial support from Gustine Rotary Club. Working with farm stewards has amplified Bill’s passion to support small farms feeding their local communities worldwide. MESA programs facilitate the commingling of the best of ancestral knowledge and modern sustainable technologies. Soon Bill will have a somewhat different experience to share with MESA stewards. Bill and his wife, Marybeth have moved a century-old farmhouse onto a city lot. While the original garden at Contented Acres Produce will continue, Bill will also be growing produce in a large backyard garden within the city limits. Marie earned her B.A. in Sociology with an emphasis in Latin American Studies and a minor in Spanish from Bates College. She has spent extensive time living in the highlands of Ecuador working with a non-profit organization, Ecovida, focused on promoting sustainable agriculture, revaluing indigenous culture and empowering indigenous farmers. Previously, she worked at Multinational Exchange for Sustainable Agriculture (MESA) where she assisted in the coordination of the farmer exchange program and was a liaison with MESA’s global partners. She continues to support and volunteer with MESA and is the fundraising point person in the U.S. for Ecovida. Marie is dedicated to creating a more socially just and sustainable world. She brings a wealth of experience with international non-profits, sustainable agriculture, program evaluation and project administration as well as knowledge of Latin America to share with MESA. She worked most recently as part of her graduate program at CISabroad, a third party study abroad intern abroad provider. Prior to that, she worked with Fair Trade USA on the Supply Chain Services team on their impact reports. She has lived in Ecuador and Argentina and traveled in Peru, Uruguay, Guatemala, Mali and Italy. She first became involved with MESA in 2004 as an intern and has continued to be a loyal supporter of MESA. She has worked with MESA in a number of different capacities since then, as an assistant program coordinator and conducted an evaluation of MESA’s Ecuador program. On the side she is a Project Manager for Ecovida, an Ecuador-based NGO working to improve the quality of life for Ecuador’s Andean indigenous population through community development and sustainable agriculture. Marie is fluent in Spanish, and received her B.A. in Sociology with an emphasis on Latin America and Spanish from Bates College and her M.A. from SIT Graduate Institute in Vermont. A former MESA Host, organic farmer, and sustainable development consultant, Scott has 32 years of organic agricultural production experience in the United States and Mexico. Scott’s recent project experience includes the restoration and development of an organic agricultural project and education program on a 250-acre historic farm owned by the County of San Diego. Scott designed and built a 15-acre organic farm supplying the boarding high school on site and selling to the Whole Foods stores of Southern California. Scott has served as an elected California Conservation official for the last 12 years managing a $ 3.5 million dollar annual budget for conservation projects in North San Diego County. Scott serves as the president of the South Coast Resource Conservation and Development Council which covers two-thirds of California’s population. He has worked extensively on conservation projects with the National Resource Conservation Service in California. He specializes in farmland preservation projects utilizing Smart Growth Principles. Susan Coss is a long time marketing and communications strategist in the sustainable food and beverage worlds. She is co­founder of North of the Border Adventures, a media, events and consulting firm. Previously, she was the Director of Marketing and PR for CUESA, the organization that runs the world famous Ferry Plaza Farmers market in San Francisco. She was also a co­founder and former director of the Eat Real Festival, an annual food event in Oakland and Los Angeles CA that drew more than 250,000 people in its first three years. She was also part of the team that brought national attention to the “food movement” through Slow Food Nation. She has spent time in Mexico since 2003 and has established relationships within the food world all over California and Mexico. She has a degree in Agricultural Economics from the University of Wisconsin, Madison. With a Business Economics degree, Melanie spent over a decade developing marketing and learning resources for the corporate world before turning her attention to sustainable agriculture and environmental and social concerns. In the agriculture sector, she founded Om Organics in 2002, the first farmers market-­to-­restaurant co­op in the San Francisco Bay Area serving over 70 restaurants in SF, and FarmsReach, the first scalable online marketplace for farmers to sell to institutional and wholesale buyers (in 2009), and the first community­ based business platform for California farmers and the dozens of nonprofit organizations that serve them (in 2013). With her systems thinking approach and attraction to practical solutions, she has facilitated and participated in numerous agriculture strategy initiatives both in California and nationally.